Abalone are large marine snails or gastropods belonging to the family of molluscs. Abalone have a hard ear shaped shell and a muscular foot (the edible part) which attaches the animal to the reef. Abalone have a unique succulent flavor that are in large demand around the world especially in Asia. There is also an increasing high demand for abalone meat within Australia. The greenlip shells have a bright "nacre'' that is like a mother of pearl and is sold as fine buttons, furniture in-lay and used in paints. There are 3 different species that commerciallyharvested in WA. These include greenlip abalone (Haliotis laevigata), brownlip abalone (Haliotis conicopora) and roes or roei abalone (Haliotis roei). Roei abalone are a smaller species that are harvested at around 70 to 75 mm and are found in generally in the shallower surf zone from 1 to 10 metres of water. 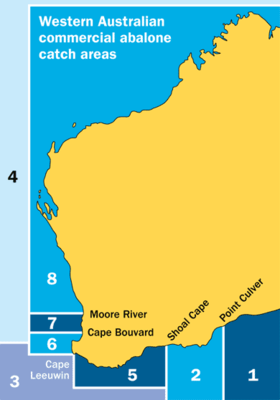 The roei fishery extends from North of Perth to the SA border. The roei fishery is on a quota system and is currently around 71 tonnes whole weight per year. The Greenlip and Brownlip Abalone fishery extends from the Busselton Jetty to the SA border. The greenlip and brownlip abalone are harvested at different sizes along the coast but generally vary from 145mm to 153mm which ensures there are large numbers left behind for breeding and recreational fishing. The Area3 greenlip/brownlip fishery consists of 8 Managed Fishing Licenses which operate between Busselton Jetty in the West to East of Starvation Bay near Hopetoun. The Area 2 greenlip/brownlip fishery runs from east of Hopetoun to the SA border and consists of 6 Managed Fishing Licences. Combined the two areas produce around 180 tonnes whole weight of greenlip and around 35 tonnes whole weight of brownlip abalone per year. Fishing is managed mainly through Total Allowable Commercial Catches (TACCs) set by the Department of Fisheries on an annual basis for each area and allocated to licence holders as individual transferable quotas (units of entitlement). A minimum number of units must be associated with each license and the total catch is limited by the TACC. A TACC is set for the Roe's abalone fishery and a separate TACC is set for the greenlip/brownlip fishery, which operates mainly off the south coast. Minimum legal abalone sizes apply. Why is the Abalone Industry Important for WA? The WA abalone is a sustainable fishery that has been around since the late 1960's and provides varies economic and social benefits to the community. These include export revenue and associated economic activity for WA and provides income for divers and deckhands, processors , administrators, truck drivers, marketing managers and service industry's such as welders , mechanics and so on. This is especially important for the small coastal towns as it also provides work for families as well as in the cities. By working in close collaboration with the fisheries department, industry, recreational fishers we can ensure that the fishery remains well managed and sustainable for generations to come. 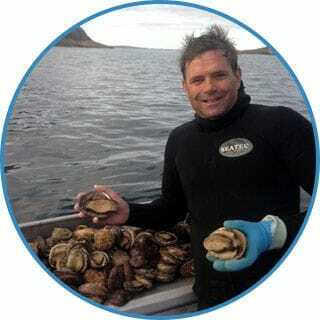 Quotas, high size limits, diver observations and the abalone being hand selected by divers are some of the tools used to help maintain healthy stocks. "Abalone divers observe changes in ocean with regards to habitat, marine creatures and environmental changes therefore can provide very important information on the ecosystem." 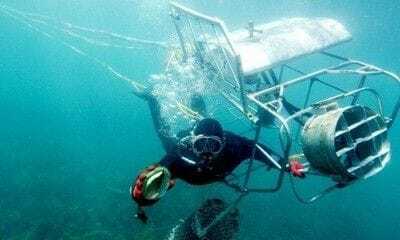 Also by having a strong wild harvest abalone industry association it provides a platform for a unified approach in decision making and communication between license holders, divers, government departments and the wider community.